Make your favorite sugar cookie dough or purchase from deli section at your grocery store. 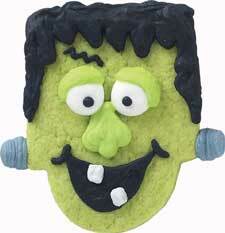 Turn tombstone cookie cutter (Wilton) upside down to decorate. Pipe in mouth with Tip 2 in black. Add Tip 4 ball eyes in white. Pipe Tip 3 ball nose and nostrils in Leaf Green/Lemon Yellow combination. Add Tip 3 hair in black. Pipe Tip 1 dot pupils in black. Add Tip 2 outline eyelids in green/yellow. Pipe Tip 1 zigzag scar in black. Tint a portion of icing gray using black color; build up neck bolts with tip 4. Add tip 1 teeth in white.